1 bottle for $49.99 or 2 bottles for $84.98. Save $15 when you buy two! Discount will be taken during Checkout. You will also receive an email after placing your order that will provide instructions on how to download your copy of the "Intermountain HCG Diet Guide", and the "Intermountain HCG Recipe Book". These books provide a wealth of easy-to-understand information, and show you step-by-step how to successfully follow the diet and lose the weight! New and improved taste! 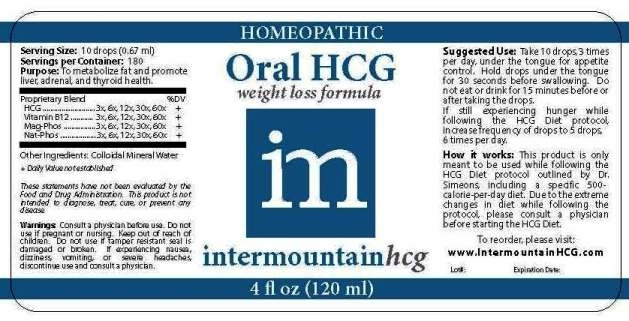 Our new formula has nearly eliminated the bitter taste of our previous HCG mixture. Same results, better taste! Instructions: Take 10 drops under the tongue 3 times a day. Do not eat or drink within 15 minutes before or after taking drops to allow absorption. If still experiencing hunger while on the 500 calorie diet, then increase dosage to 6 drops 6 times a day. WARNINGS: If pregnant or nursing consult your health care professional before using this product. You should consider talking to your doctor about any new diet or weight loss program before use.